If I were to be reincarnated as a salad and it happened to be twenty degrees outside, I would surely be re-birthed as this beaut. It just speaks my language! For my final #MakeYourMove recipe with Kohl’s, I wanted to feature a rustic, simple, cozy, elegant, and downright delectable salad that doubles as a full meal. One that would impress herbies and carnivores alike. After all, we’re approaching a new year and there’s never been a better time to put the healthy hat on! Side note—if you’ve never had roasted potatoes nestled in a salad, you’re in for quite a treat. And there’s something about rosemary…the way it smells, the way it tastes…it gives me all the feels. If you’re one of those bad eggs that loathes rosemary, you can go eat some gingerbread while we all swan dive into the land of love lettuce that is this salad. When I eat salad, I like it to be complete. I don’t want mixed greens with balsamic and cucumbers. I want fiber and protein and crunch and pizzaz! This salad has sass. A salad after my own heart. 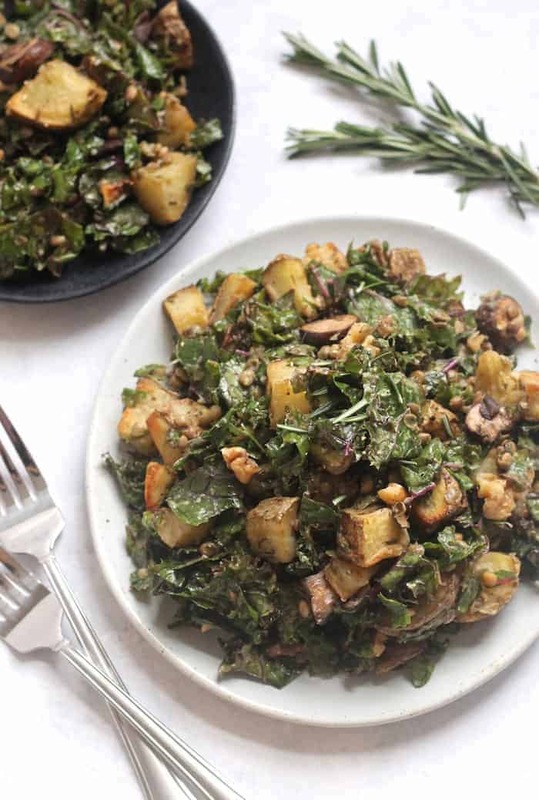 With high-protein lentils, brain-boosting walnuts, earthy shrooms and taters, and aromatic rosemary, this dish is just dripping with all the fantastic adjectives. When Hummusapien gives you a great excuse to eat potatoes and call it salad, you take it and you run with it. Run far, far away. 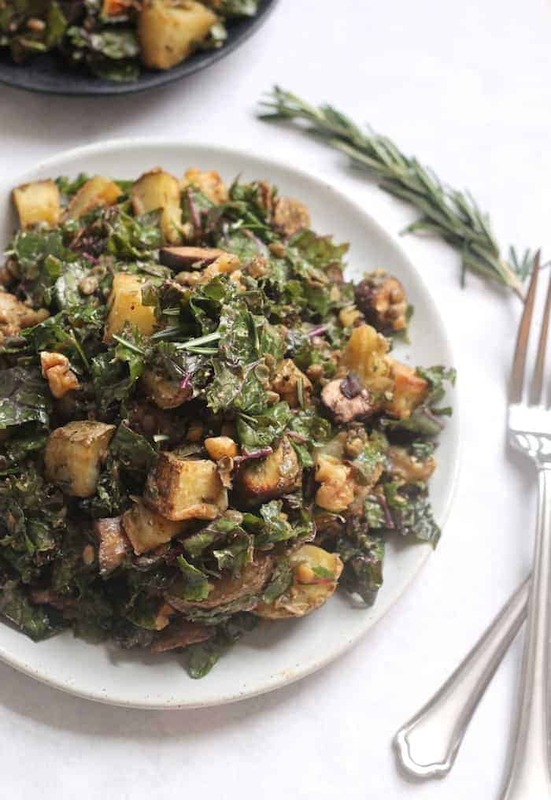 An rustic winter kale salad packed with toasty walnuts, earthy mushrooms, lentils, and a tangy shallot dressing. 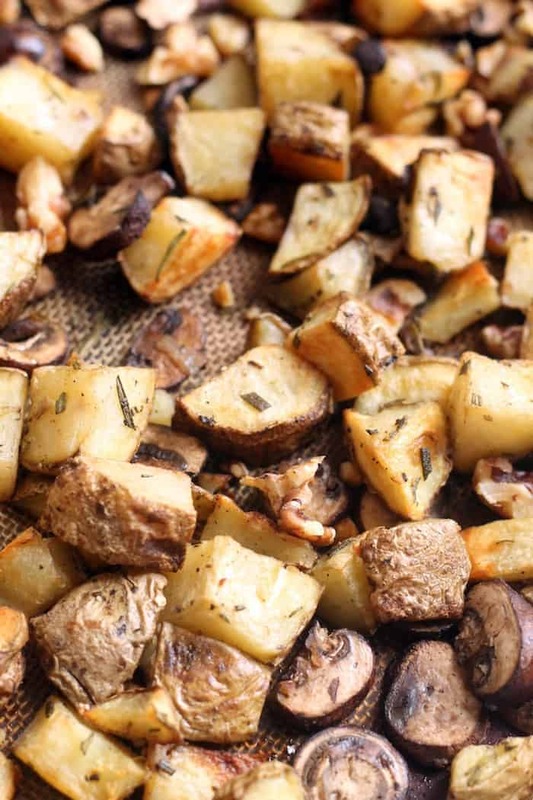 Place chopped potatoes in large bowl with rosemary, olive oil, salt, and pepper. Toss to coat. Dump potatoes on baking sheet and spread out in an even layer. Roast in oven for 45 minutes (or until tender), stirring halfway through. Remove from oven and add sliced mushrooms and walnuts. Bake for another 10-15 minutes, or until everything is browned. Meanwhile, place dressing ingredients in a blender or food processor (I used my Nutribullet) and blend until smooth. Dump kale into a large bowl. Add dressing and massage into leaves for about a minute (if using lacinato, massaging is not necessary.) Add lentils and baked potato mixture. Stir to combine and season with salt and pepper to taste. This salad is EPIC! Love the addition of the rosemary potatoes! I need to make it ASAP! This just looks DELISH! I will definitely print this out and add it to next week’s menu! Super yum! LOOKS DELISH! I love roasted potatoes…I love lentils…Oh wait I love all food! Have a Happy New Year friend and here’s to a AWESOME 2016!!! There’s nothing wrong with potatoes :( I don’t know why someone would need an “excuse” to eat them. This salad looks delicious though!! Whoever doesn’t like Rosemary be cray. It’s freaking amazing, especially with roasted potatoes. I would shovel this whole plate in my mouth like no one’s watching. I hope you have an amazing New Year, love! Cheers to 2016! Yeah, I loved this meal! I had to stop myself from eating the whole freaking thing so my husband could have some dinner when he got home. I’ve been intrigued by this recipe for awhile, but haven’t actually made it yet. Does this work well as a make-ahead salad so that you can put it all together once and then keep it in the fridge for a couple days to have for multiple meals? Or would you recommend keeping the components separate (e.g. by not actually dressing the salad) if you want to keep it for a few days? I mix everything together! The kale is sturdy so it holds up well. I use lacinato and toss it all together–i don’t massage the dressing into the leaves. It’ll last a few days all mixed together in the fridge! Just made this for the firs time–yummy! I added cooked quinoa for extra protein punch, and left components separate and just mixed up what I wanted to eat tonight so it will be nice and crispy for lunches during the week. Thanks for a great recipe! Loved this! So satisfying. My only tweak was adding roasted fennel, just to use up a bulb that was languishing in the fridge. This will be a repeater for sure. Alexis, this was delicious. I was blocked as to what to make for the holidays and I saw this. My family thoroughly enjoyed it. Bless You! I’m so glad, thanks Barbara!